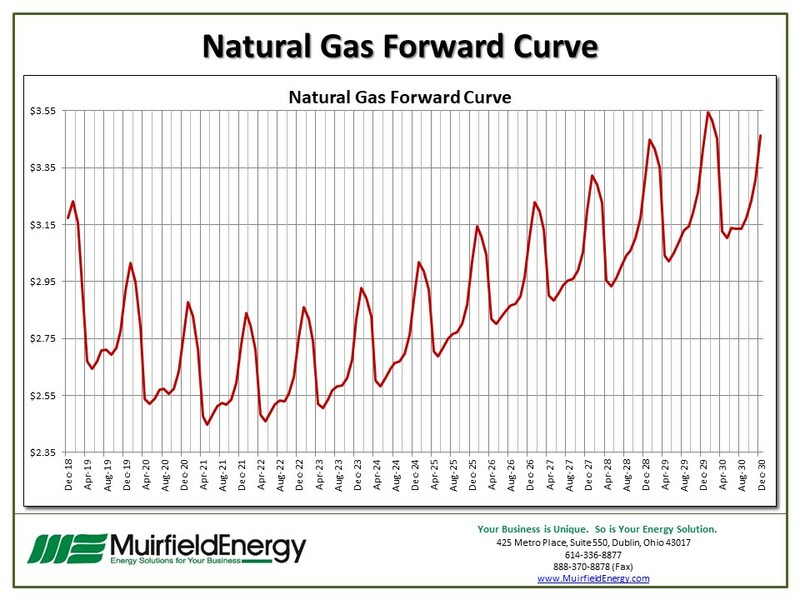 This month, we will recap the natural gas market’s movement over the last month. The easiest way to say it, is that the market has been on a see-saw trajectory upward. 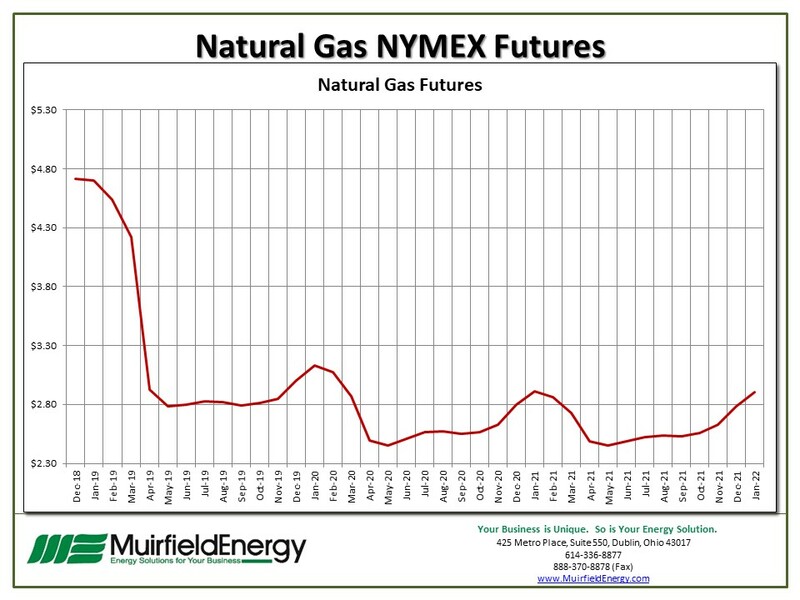 The NYMEX natural gas December 2018 contract started at $3.237 and closed at $4.715, which was the highest natural gas settlement since May 2014. 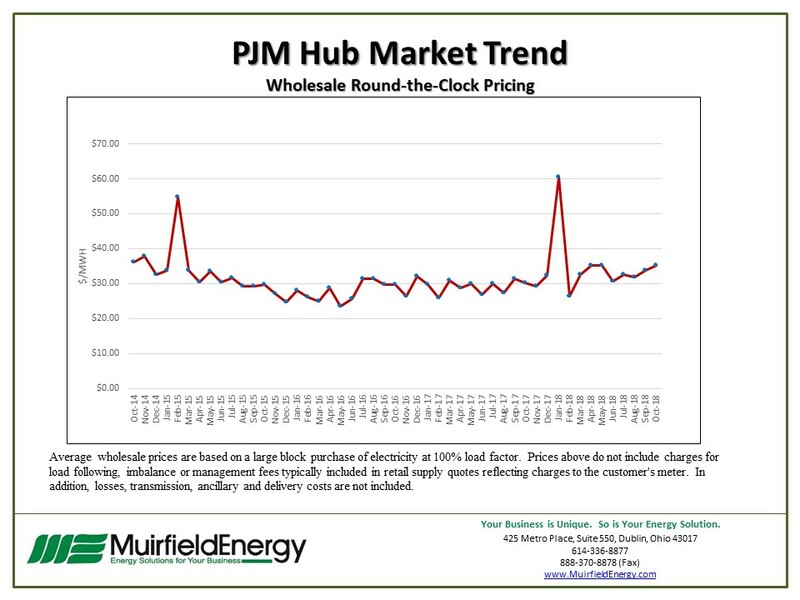 The price increase has most significantly impacted this winter’s contracts. If your business is looking for ways to reduce natural gas or electric costs, contact our corporate office at 888-370-8898 or your local Muirfield Energy Consultant directly. You may also contact us online to learn more. Below are this month’s charts. Click a thumbnail image to view the full-size PDF attachment. Welcome to this month’s Monthly Minute with Muirfield. This month, we will recap the natural gas market’s movement over the last month. The easiest way to say it, is that the market has been on an see-saw trajectory upward. 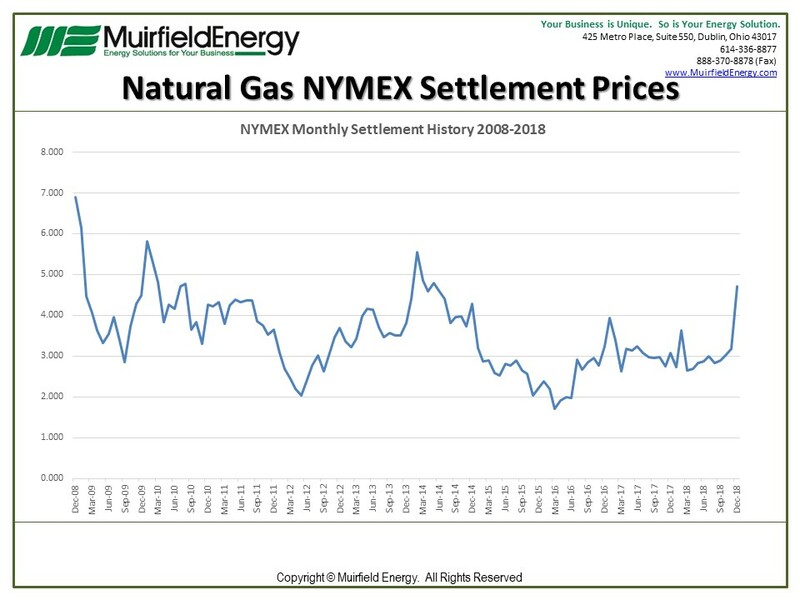 The NYMEX natural gas November 2018 contract started at $3.237 and closed at $4.715, which was the highest natural gas settlement since May 2014. 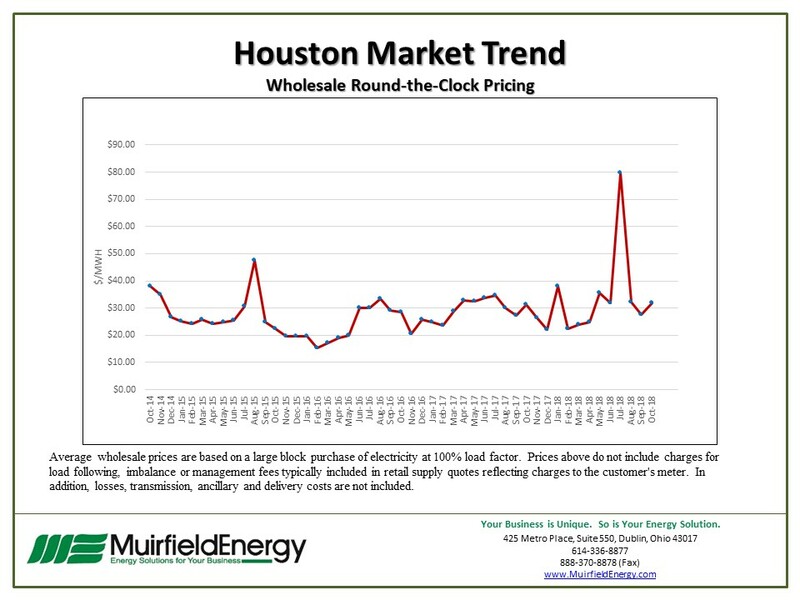 The price increase has most significantly impacted this winter’s contracts. 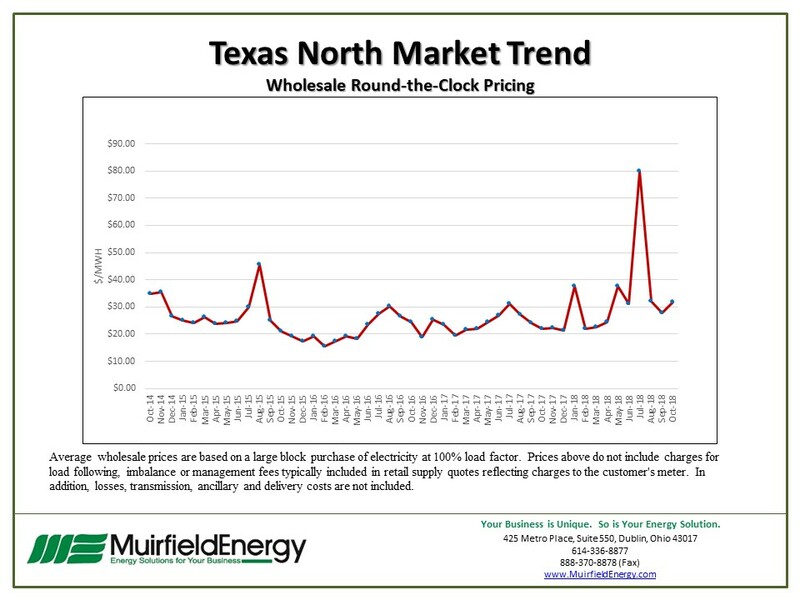 Colder than normal temperatures, this early in the winter have definitely caused prices to increase. The natural gas storage deficit compared to last year being down 17% (3.054 trillion cubic feet) and 19% lower than the 5 year average, have also helped to drive prices higher. Massachusetts Mass Market Default Service Rates will be increasing 14-17%. West Penn Power Commercial Default Service Rates will be increasing 64%. Met-Ed & Penelec Default Service Rates will be increasing 14%. If your energy supply agreement is expiring this winter or if you have positions that you need to be secured before the end of this winter, you need to contact your energy advisor as soon as possible to discuss the risks of different product types and price options to secure your company’s energy supply. If you have any questions, we will gladly help to answer them. You can contact Muirfield Energy’s corporate office at 888-370-8898 and we will have one of our local Energy Consultants speak to you. Thank you for watching the Monthly Minute with Muirfield! Have a great day and we will see you next month!